Youth Work Essentials is an online, 'one-stop shop' of core information for youth workers and volunteers. Register or sign-in to use a suite of resources to help you develop quality and inclusive programmes for young people. Up and Running - All the information you need to run quality youth work programmes, including guidance on fundraising, management committees and programming. Safe and Sound - A clear and comprehensive guide to safe youth work practice, including child protection policies, recruitment and selection of volunteers and health and safety. Law at Work - A host of information for voluntary management committees, including sample contracts of employment, sessional worker contracts, an employee handbook and guidance on equality legislation. Please note: Law at Work is only available to Youth Scotland member groups. Outcomes for Youth Work - a comprehensive toolkit of information, case studies and worked examples on the themes of Setting Outcomes, Measuring Outcomes, Analysing Outcomes and Reporting on Outcomes in Youth Work. Please note: The Outcomes for Youth Work Channel is still being finalised and will be available shortly. Volunteer Induction - Providing you with guidance on how to induct volunteers in youth work. Please note: The Volunteer Induction Channel is still being finalised and will be available shortly. Each resource includes downloadable fact sheets and templates that can be adapted and used for your own purposes. Have a look at an example here. 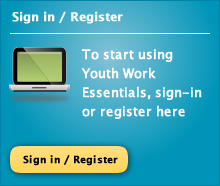 Click on sign-in/register to gain access to Youth Work Essentials. Please note: If your group is a member of Youth Scotland, your group will also have a group log-in. This group log-in provides access to the Law at Work Channel. Access to Law at Work is a Youth Scotland member benefit only. 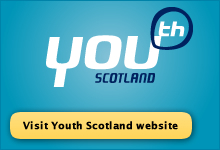 For more information about becoming a member of Youth Scotland, please visit our main website.